Rotherham salvaged a late point away to fellow Championship strugglers Reading in a closely fought draw at the Madejski Stadium. Ovie Ejaria looked to have made the decisive contribution after rounding off a flowing Reading move in the 31st minute. The midfielder, on loan from Liverpool, looped a fine finish into the far corner after getting on the end of Garath McCleary's cutback. But Semi Ajayi turned home a vital Rotherham equaliser in the 79th minute after Will Vaulks' cross was flicked on by Clark Robertson. Reading pressed hard for a winner in the closing stages, but Nelson Oliveira and Ejaria both missed chances from close range and Lewis Baker headed straight at Marek Rodak in the Rotherham goal. Rodak was then almost caught out when Reading substitute Mo Barrow beat him to the ball outside of the penalty area, but the goalkeeper recovered to smother at the feet of Oliveira. 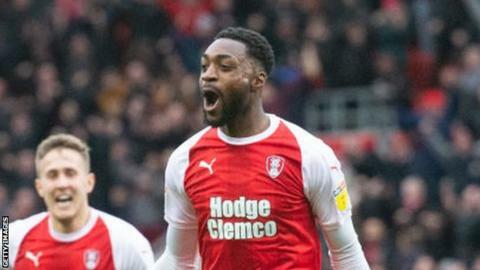 Rotherham's fifth consecutive draw left them one place below Reading in the relegation zone, but only goal difference separates the two sides. Reading, who have now won only one of their last seven matches, had defended well prior to Ajayi's later equaliser, and will rue a missed opportunity to move clear of the relegation zone. "I'm frustrated to get just one point. We created a lot of situations we could have finished another way. "Against a team playing direct football, you can never think you have the three points in your pocket. The lesson for the future is, even when you're winning, you must play to score. I understand that the players want to keep the points, but it's not enough. We must play all games to win. "Today the fans made a lot of noise supporting us - they deserved the three points. But nobody can say the players didn't want to fight. They were brave. They worked well. In the end, we have one point more. We need to rest and start to prepare for the next match." "I said to the lads at half-time, it doesn't feel like you believe you're going to score. "We did have a bit of the play, but we didn't look like we were getting on the second balls. In the second half, we had a much better threat. They nearly scored at the death after a mix-up with our keeper. That would have been very a hard pill to swallow. "It's a good point for us. There are still twelve games left. A loss would have ruined the little run we're on, but I think our lads will take more from the game than them. "I've just told the lads how proud I was of their second-half performance. Most of their individuals are faster and stronger than ours, so we had to really dig in, and we looked fitter and stronger at the end of the game. We're giving ourselves a good chance [to stay up]."